From dirt pit bathrooms to homes crawling with critters, life could be pretty disgusting for people long ago. This set takes readers back to times when conditions were very different from today. 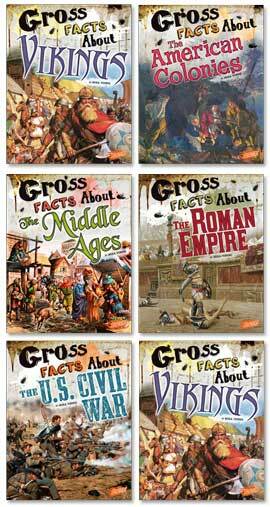 Engaging text, period photos and illustrations, and primary source excerpts bring each era to life. From moldy food and dirt covered clothes to poisonous pests and extreme weather, American colonists had a dreadful time in the New World. Get ready to explore the nasty side of life in the 13 American Colonies. From leftover trenchers and stinky chamber pots to barber surgeons and the black plague, life could be really miserable for people during medieval times. Get ready to explore the nasty side of life in the Middle Ages. From garbage-filled streets and spoiled food to bloody gladiator fights and deadly punishments, daily life in Rome was really rotten. Get ready to explore the nasty side of life in ancient Rome. From crawling lice and deadly diseases to bloody battles and crammed prison camps, life was truly terrible for Union and Confederate soldiers. Get ready to explore the nasty side of life during the U.S. Civil War. From smelly ships to violent wars and icky battle wounds, life was rough for Vikings. Get ready to explore the nasty side of Viking life.